This year holiday shopping for your endurance athlete at home just got a little easier! 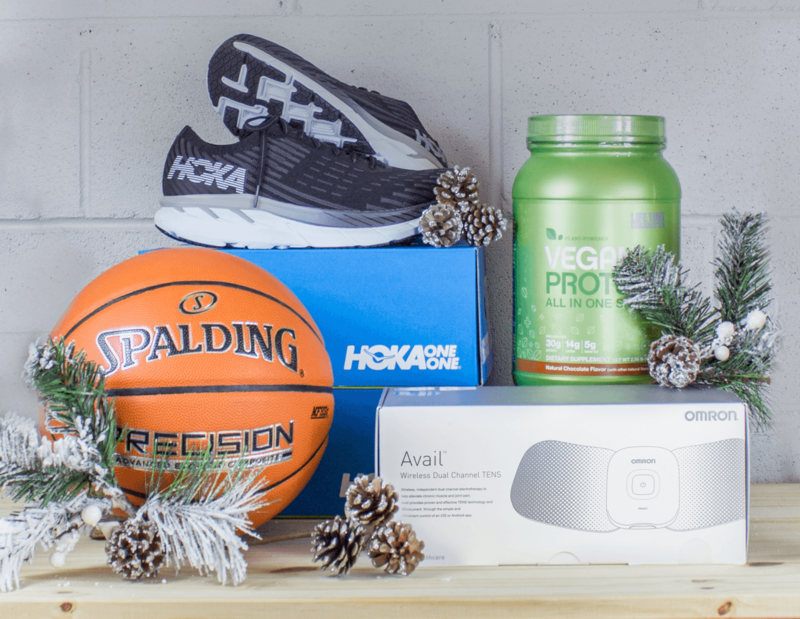 From fitness gear and apparel to recovery tools and nutrition support, this roundup can help you find something for all the health-lovers on your list. Fitbit Versa is a personalized daily health and fitness companion that empowers you to take action, make the most every moment, stay connected and reach your goals. Versa is a modern, full-featured smartwatch with advanced all-day health and fitness tracking, on-screen workouts, personalized health dashboard, and essential smart features like notifications and quick replies for Android users, phone-free music and thousands of popular apps and clock faces, that is waterproof up to 50 meters – all powered by 4+ days battery life. It is the perfect gift for all levels of lifestyle and fitness, available in rose gold, black or silver. Living a healthy life doesn’t mean you live without pain! Get drug-free pain relief with Omron Avail®. Avail delivers proven and effective TENS technology that physical therapists and chiropractors have been using for over 30 years! Now you can alleviate acute and chronic muscle and joint pain, including arthritis, at home without a prescription. With wireless Bluetooth® connectivity for pain relief on the go, Avail has 5 pre-set body pain modes, 5 massage modes and 20 intensity levels to soothe pain at multiple locations, including sore shoulders, lower back, legs, elbows and knees. The Clifton 5 is the latest in the family of award-winning Clifton shoes. True to its heritage, the 5 is light, cushy and very, very fast. The 5 also has an all-new all-knit upper. The knit upper offers support and flexibility where you need it. And the lightweight fit seems to mold to your foot. The Clifton 5 knit maintains the famed HOKA midsole geometry and a trusted foam package to help provide consistent cushioning through the life of the shoe. Combined with the forgiving and adaptive forefoot, we’re talking a smooth, smooth ride. The all new Black Label Collection. Led by the completely reimagined Velocity Jersey for Men and Women with new, modern sleeves, trim cut, and 4th zippered pocket – it is our best-performing and most exciting release yet. Available now and paired with the popular Black Label Bibs and Shorts. SKILLROW™ is the first fully connected indoor rowing equipment that trains both cardio and power at athlete’s level, thanks to its sport-specific design, exclusive technology and performance-oriented workouts. The resistance delivered by SKILLROW™ was designed to follow the natural curve of the stroke in the water. We named it AQUAFEEL™. Thanks to AQUAFEEL™, the resistance is more gradual, making the movement fluid throughout and avoiding the backlash effect on the lower back. SKILLROW™ is engineered to endure strenuous workouts in complete safety. The ergonomic design combined with the high-quality components and materials ensures the maximum durability and reliability of the product. A healthy on-the-go meal option – each 210 calorie serving provides 30g of vegan protein, multivitamin and fruit/vegetable blends, fiber, probiotics and digestive enzymes. Dairy-free, gluten-free, vegan, vegetarian, non-GMO. Contains no aspartame, no sucralose, no synthetic colors, no preservatives. The TriggerPoint GRID VIBE™ Plus is a vibrating foam roller that provides clinical therapy technology in a compact, portable, personal unit. Designed with four vibration frequencies ideal for pain relief. Features TriggerPoint’s patented GRID® pattern to replicate the feeling of a massage therapist’s hands to help channel blood, improve oxygen flow, and heal tissue. The GRID VIBE ™ Plus is the roller of choice to prepare the body for peak performance by helping users relieve muscle and joint pain, and improve flexibility, balance and mobility. Springfree® Trampoline features a revolutionary springless trampoline that’s engineered for safety and built to last. Made from the highest quality materials, the Springfree® Trampoline has no springs, no hard edges, a hidden frame where it’s impossible to fall on and a flexible enclosure. Plus, it’s backed by a world-class 10 year warranty on the entire trampoline. The Jumbo Round Smart Trampoline is the only Springfree® that comes equipped with the tgoma™ game system. Designed to provide hours of educational and cognitive learning, tgoma™ encourages families to go outside and be active. Bring home the world’s safest trampoline this Christmas! No net is safe. It could be because of the deep channels that offer great grip or the light color that makes it stand out. Either way, this basketball is a shooter’s dream. Backed with recycled material, the ball has a soft feel out of the box. It’s made for the top high school and college athletes in the country, with an Eco-Grip™ composite cover that’s built for the hardwood and born for the net. We have partnered with Splits59 to bring you the softest, most cozy loungewear you will live in. HYLETE’s performance-enhancing legging includes an adjustable length, breathable fabrics, and strategic pocket placement. Mesh cuffs can be easily tucked away for a capri length or extended to provide more coverage. Bonus: the Nimbus Caprite is designed for ALL body types and is NOT see through! All HYLETE products come with a 100% fit guarantee. The Hypervolt is a cordless state-of-the-art vibration massage device that relieves muscle stiffness and soreness, increases circulation and range of motion, and improves the overall health of the body’s soft tissue. 3 speed settings deliver up to 3200 percussions per minute, 4 interchangeable head attachments allow for targeted muscle massage, and a lithium-ion battery provides up to 3 hours between charges.